Chair décor is one of the most overlooked details. But with the right embellishments, you can transform even a standard folding chair into a beautiful part of your wedding vision. Here, check out our favorite ideas for your ceremony, sweetheart table, and reception tables. 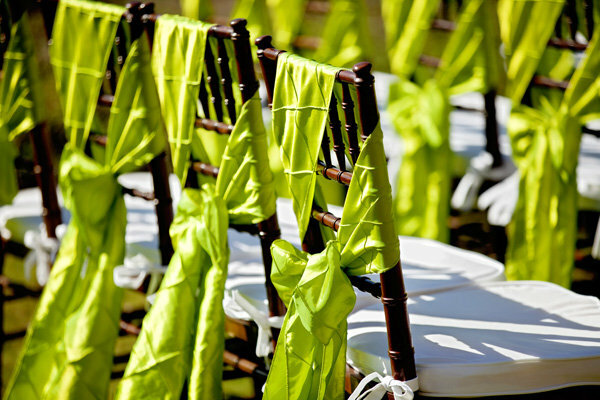 Tie long sashes that coordinate with your color scheme on the chair backs. Starfish, grass skirts, and sea green sashes fit perfectly with a beach wedding. Simple strands of ribbons can give you a luxe look for less. Take your guests on a trip down memory lane by lining your aisle with photos of the bride and groom through the years. Punch up your ceremony décor with bright chair pads that match your color scheme. You don't need to decorate each seat to get a gorgeous effect; try hanging a garland just along the last row. Dangle crystal-covered vases filled with roses along the aisle. Fill mini vases with a single bright flower, like this pink lily, accompanied by greenery and a coordinating ribbon. Instead of chairs, give your ceremony a more intimate, homey feel by using benches accessorized with pillows. A sheer overlay with a ruffled train gives off such a romantic vibe. For a modern look, try a structured wide sash gathered with a bow. Photo Credit: Archetype Studios Inc.
Whimsical paper pinwheels are a fun choice for a casual, backyard wedding. Add ruffled skirts to your chairs. Gold sequined covers instantly add glamour to your reception space. Pretty pink rosettes and chair pads punch up plain white chairs. An apple garland adds a rustic touch. Adorn each chair with a lei. Give your reception a regal feel with draped chair covers. For a chic look, try ruched chair covers cinched with jeweled accents. String the letters for "Mr." and "Mrs." on a ribbon that matches your color scheme. Set your chairs apart and show off your new status with a "just married" burst. A perfect symbol of your union, tie an ampersand between your chairs. Give your signs a fun twist by using a whimsical font. Hang small "bride" and "groom" chalkboards from your chairs. For a rustic touch, create signs out of wooden planks. Eyelet banners are the perfect choice for a vintage-inspired wedding. Paper cutouts tied with lace give off a low-key vibe. Show off your new monogram!